Santiago de Compostela is one of the most beautiful and visited cities in Spain. How not to be, if it concludes the pilgrimage of the Camino de Santiago, which is a reference both tourist and religious level of the European continent. If you have plans to spend a few days discovering this city full of mysticism, then you should know some of the activities you should do and what places you should visit in Santiago. This Galician city is considered a World Heritage Site. Every July, it receives thousands of parishioners who follow the path of Compostela: some of them are walking, others by bike and many others by their cars. 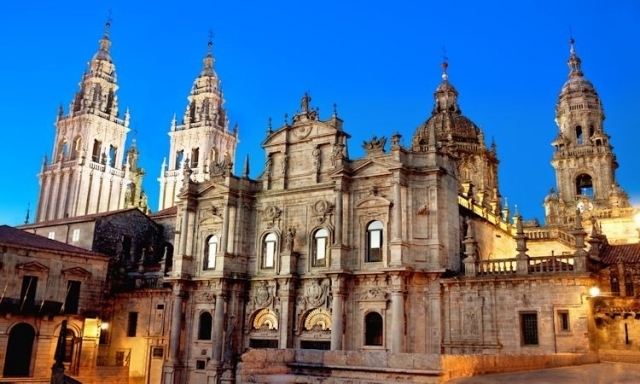 If you decide to spend a fun family holiday in Santiago de Compostela, it is best to book your hotel in Santiago de Compostela before starting the trip. A recommendation that we can offer you before you start preparing your luggage is that you wear comfortable but at the same time waterproof clothing. In Santiago, the weather is not constant, but what we do know is that rain is more common than in other regions of Spain. Depending on the time of year, temperatures can be very low. In general, the whole northwest area of ​​Galicia is cool even in summer, when the highest measure is 20 ° C.
Then, we will indicate some points for both religious and adventure tourism, restaurants and even activities that you have to do to have the best experiences in this city. They say that all roads lead to Santiago and, indeed, it is like that. All arrive at the beautiful Cathedral, a true architectural work built between 1075 and 1211 by King Alfonso VI, which is also a magnificent combination of Romanesque, Baroque and Gothic styles. Many of the visitors are moved by its beauty, by its chapels, towers, but above all by the crypt where the remains of the Apostle Santiago rest. It is in honor of him that thousands of parishioners make a pilgrimage each year to the famous Camino, a tradition that goes back to the Middle Ages. This should be the beginning of your holidays in this city, we assure you that after visiting the Cathedral of Santiago de Compostela, you will fall in love with this city. Declared by Unesco in 1985 World Heritage Site, the old town of Santiago de Compostela will fascinate you as its story is told by itself. It grew over the years around the Cathedral. In its beautiful Plaza del Toural you can start a route of places that you can not miss. Known because in it the pregonero vociferated the municipal agreements as well as the ordinances of the Archbishop, this place has a lot of history between its corners. Even acts of faith in the time of the Inquisition were staged in this place around the year 1570. Today is more than a place to rest. It is part of a story that does not need to be told but lived in the flesh, so we recommend you visit the Plaza de Cervantes that will surely thrill you. Although this city is more than known for the religious part, it is also true that it has much more to offer, with local shops in the locality, as well as a lively nightlife for party lovers. In Santiago you can also find a wide cultural calendar especially planned so that tourists and citizens of the city enjoy activities for all kinds of tastes and ages. If you prefer to go shopping, in Santiago there are many shops that offer visitors artisan items unique to the region, as well as the characteristic memories that you can take to family and friends of your visit. For lovers of jewelry, we tell you that one of its main designs are the famous medals of the Apostle Santiago in silver and jet. They are also recognized for their work in leather, glass, ceramics and goldsmiths. For those moments when you have to recover your energies, we are going to recommend that you visit the restaurants and bars with native cuisine of the region so you can try their delicious typical dishes. The specialty of the inhabitants of the Galician region are fish and seafood, but if you really want to try a unique dish of the area, then we recommend you enjoy a Galician empanada, which are stuffed with cod, scallops, tuna or octopus. They are also known for their tapas and octopus "á feira". Visiting Santiago de Compostela is an experience that you must live, and we assure you that you will not regret spending a few days of holidays with family, with friends and even if you decide to do it alone.